New tracks seem to be the trend for the Team USA members that I’ve highlighted lately. Mike Rodgers has been a regular on the sprint scene for the past several years, and was part of the 4×100 relay pool. Unfortunately, he suffered a stress fracture in his foot after the trials, and had to withdraw from London. Jeff Demps was his last-minute replacement. 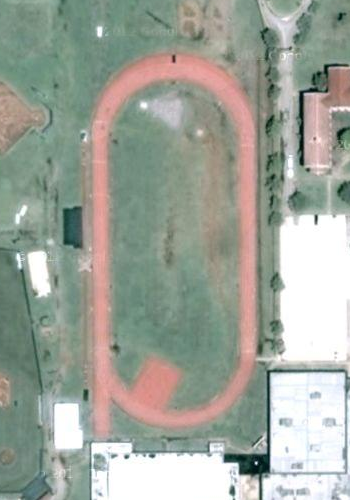 In college, Rodgers competed for the Bison of Oklahoma Baptist University, but not on the new Eddie Hurt Jr. Memorial Track that opened in 2008. He ran on the old one that was located right next to this new one. OBU is a small NAIA school, with an enrollment of just under 2,000 students. Two other OBU tracksters ran in London, both Jamaican hurdlers. Latoya Greaves competed in the 100m Hurdles and Nickeisha Wilson ran the 400m Hurdles.